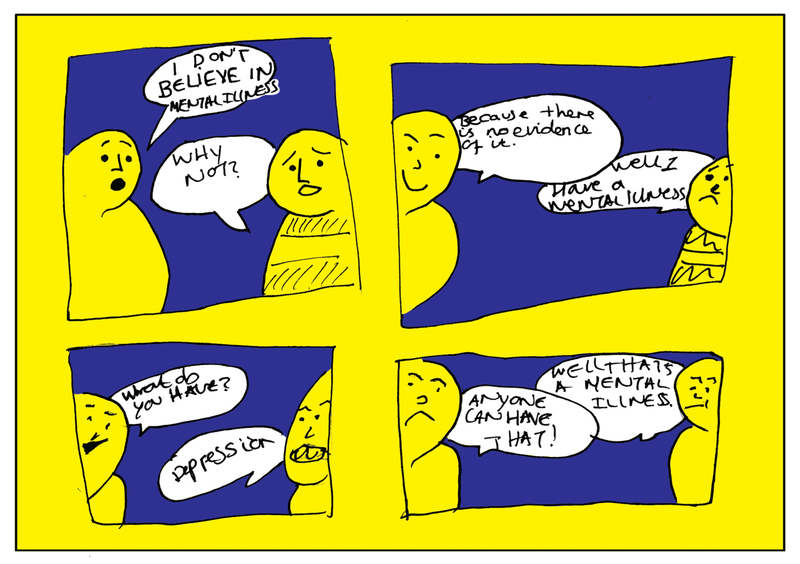 IAYMH | International Association of Youth Mental Health Conference 2013. 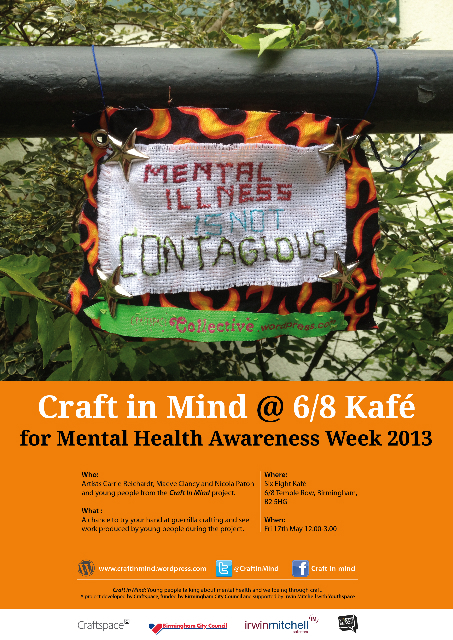 You are invited to come along and meet artists and participants from our Craft in Mind project on Friday at 6/8 Kafe in Birmingham. The day will include the chance to make your own cross stitched mini protest banner and a chance to meet the artists and young people involved in the project and see the artwork produced in the café. As if The Comic – project documentation wasn’t enough, we thought we would spoil you by giving you a video too. in this first episode you will see us experimenting with clay, tile decals, and getting to grips with illustrations. for day two you will also see us running around the Custard Factory site installing our first mini protest banners care of the Craftivist Collective and depositing our Messages in Bottles. 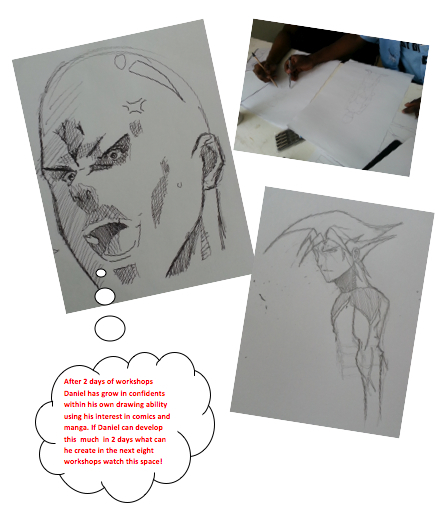 Between the comic and these short films you will truly get a feel of what it is like to be in one of our workshop sessions and an understanding of what we are trying to do. The first episodes are just about us getting to know each other and understanding what Craftivism is all about. As the Project continues we will be tackling Issues about Youth Mental Health and the projects aims and objectives will begin to tie together. We hope you enjoy the movie. Please do leave a comment. Well today we’re carrying on with our artistic experiments. Everyone is getting a go to improve their illustration skills with Nicholas. We’ll be creating more decal transfers for the ceramic art and getting our fingers dirty in some wet clay too. Aside from that today we thought it would be nice for the participants to have a go at some Craftivism! Much along the lines of ‘PostSecret‘, a few participants anonymously added a message about their thoughts on mental health/positive thinking/their own lives and positioned it somewhere around the custard factory area of Digbeth. If you find a message in a bottle or any other Craft In Mind craftivism art around Digbeth, let us know with a picture and a message to our twitter or facebook. Can’t wait! Well, we had a great first day. A large attendance of young people and a genuine buzz of excitement from Craftspace staff, artist, volunteers and participants. Today was a day full of experimentation, working with clay, ceramic, carbon transfers, decals and a variety of illustration and sewing techniques. We ‘tweeted‘, we ‘facebooked‘ and ‘blogged’ all the evidence, so please follow us and keep up to date with our progress. The Craft in Mind project has been brought into being through the passion of one young person, Vicky. Vicky first got involved with Craftspace in November 2011 when she took part in an action research project for their touring exhibition Made in the Middle. Vicky learned about the project through The Prince’s Trust Fairbridge Programme . At the time she wasn’t very interested in craft, in fact she was quoted saying “I thought craft was just for old people.” During the project Vicky, along with three other young people, got to work with three different professional craft maker, learning all about their practices. you can see how she got on in the film below. Vicky stuck with Craftspace, joining their ongoing youth project The Craftspace Collective. Through the collective she worked with many more artists, learned how to devise and deliver creative participatory workshops and became interested in Craftivism. During this time Vicky blossomed, she volunteered to part of The Big Lottery Fund youth panel and became a volunteer with Youthspace, who she is now employed by as an apprentice. Hear her story in her own words in the film below. Vicky told the rest of the Collective members about the Time to Change campaign and how she wanted to do a craftivist workshop when their pop up village event visited Birmingham. We devised a machine embroidery workshop inviting people stitch their response to the question “How do you Feel?”. This was so rewarding Vicky, Craftspace and Youthspace put their heads together and Craft in Mind was born. Are you aged between 15 to 19? Live in Birmingham? Interested in gaining experience of working in the creative industries? Want to gain a recognised qualification? 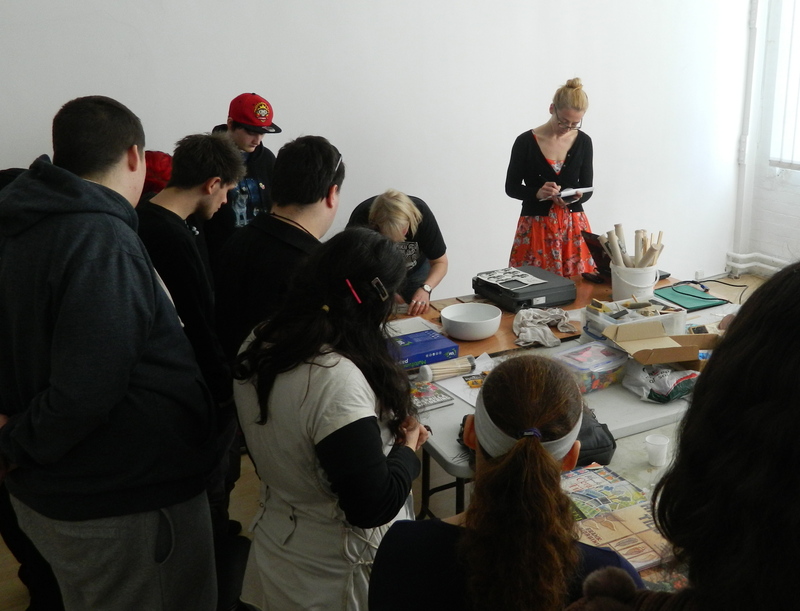 Craftspace, in partnership with The Princes Trust and Youthspace, are currently recruiting. We need 10 young people aged 15 to 19 to work alongside a team of creative professionals to develop a Craftivist / guerrilla craft toolkit which enables conversations about mental health and well-being. Working with a professional team of artists, makers and illustrators you will have the opportunity to learn hands on, about cutting edge contemporary craft and design practices, illustration and social media marketing. Over the course of 10 half day sessions your role will be learn new techniques and skills to create artwork with a social message about mental health and well-being, in a style that young people can relate to. Through your artwork you will assist the professional team to develop a workshop/toolkit, which you will have an opportunity to pilot to your peers. You will also have the opportunity to gain experience in a social media marketing campaign aimed at getting our message out to the world and publicise our launch event in Birmingham City Centre. The project will take place on Thursday and Friday afternoons at the Custard Factory between April 18th and May 18th. Opportunities to pilot the toolkit will take place in June and July. All travel expenses will be covered (day saver bus ticket) and refreshments will be available at each session. This project is funded by Birmingham City Council’s Next Generation Cultural Commissioning service. Hello – this blog is very much unfinished at the moment. we are busy uploading information as it is ready. the real work will begin in earnest in early April when the young people truly take ownership and change everything. Up until then I will try and keep updating the blog with new developments. Life, outside and inside a psychiatric ward.